We continue to celebrate Women's History Month with today's post on park management. 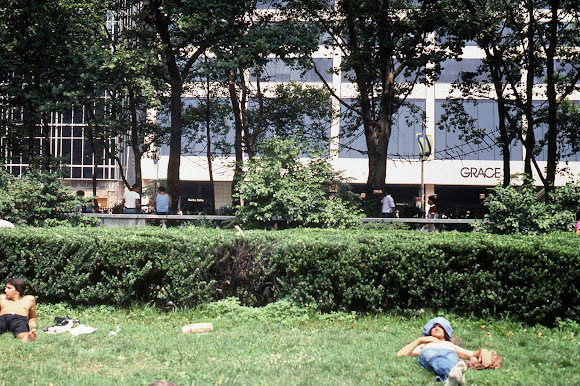 Most New Yorkers know that Bryant Park was once very different from the charming place it is today. 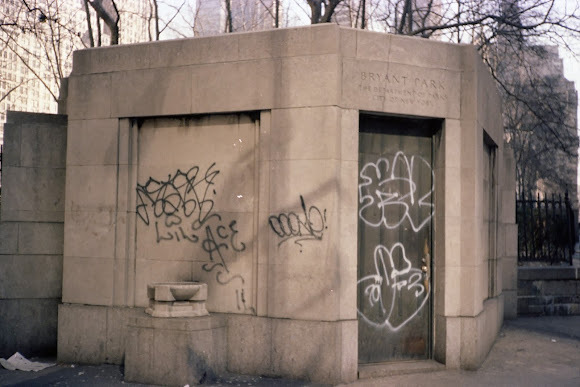 A lack of policing, design flaws, and a bad economy created an unwelcoming and dangerous park as recently as the 1970s and 1980s. These safety issues deterred most park users. At the time, the majority of visitors were men. Women were hesitant to enter the park alone, particularly because the only other parkgoers were men. Typically, women feel more comfortable entering a space when they see other women in that space. These observations of human nature were crystallized in the work of urbanist William "Holly" Whyte. Through hours of time-lapse video, taken in various public plazas in New York City, Whyte arrived at these and other conclusions on how humans interact in public spaces. These high hedges created opportunities for problematic behavior. The park's poor maintenance, evident here in the graffiti, was uninviting to potential park users. Whyte's observations on women and public spaces greatly influenced the park's redesign. The park had to be more inviting to women to create a more equal man-to-woman ratio. High hedges and walls that blocked views were leveled, eliminating blind turns and hidden areas of the park and creating a sense of openness and safety. Fixed benches were replaced with thousands of bistro chairs light enough for anyone to move, allowing members of the public to choose their own seating arrangement and create friendlier micro-environments. Additional improvements in maintenance, horticulture, and sanitation served to make the park a welcoming space. These women in the modern Bryant Park enjoy a pleasant lunch break. We know that these design elements and other tools, like park programming and sanitation efforts, have effectively equalized the gender ratio. Daily counts are conducted in the park at peak hours to ensure that the ratio is in balance. Nowadays, most counts find the population to be about 54% women, and that tells us that the park is a safe and friendly environment. For more reading on design of public space, check out Whyte's book The Social Life of Small Urban Spaces, available online at the BP Shop.